Michel Lambert is the descendant of a virtual dynasty of classical musicians in Quebec. After studying at the Conservatoire de Musique de Québec, his fascination with drums and composition inspired him to pursue his education at Berklee College in Boston, where his professors included John La Porta, Herb Pomeroy, and Greg Hopkins. Later on, he travelled to Los Angeles in ‘83, Paris, New York and Amsterdam the following three years. Since ‘82, different projects have taken him to Europe, across Canada, the U.S. and Asia, at different festivals like the Berliner Jazztreff, Jazzfest Wien, Jak Jazz in Jakarta, Pori Jazz, l’Europa Jazz Festival du Mans, Birmingham Jazz Festival, Internationales New Jazz Moers, North Sea Jazz, Bermingham, Jazzmandu Nepal, Tampere Jazz Happening, Jazz Sardigna, Civitavecchia in Festival, JVC Paris, Nancy Jazz Pulsations, Caltanissetta in Sicily, Jazz at Lincoln Center and many others. He has recorded in several countries and performed with such artists as Gary Burton, Dewey Redman, Barre Phillips, Paul Bley, Uri Caine, Bobo Stenson, Gary Peacock, Tomasz Stanko, Mat Maneri, Misha Mengelberg, Milcho Leviev, Bobby Few, Raoul Björkenheim, Jean Jacques Avenel, Sonny Greenwich, Don Thompson, Dave Young or Herbie Spanier. He currently works with Jeannette Lambert, François Carrier, Ma kotron Unit or his own project “Out Twice”. His latest recording “Le Passant” features a written score for a 12 piece orchestra confronted with the improvisers, Dominic Duval, Ellery Eskelin and Malcolm Goldstein. Critics have described some of his projects as, “Adventurous yet contained, always uncompromisingly searching", " ...a vital and important record...", “...This is art at a very high level”, "...a challenging hour of unusual fare created by a masterly drummer" or “Rare to hear music of this depth and substance, period”. An accomplished composer, he wrote in ‘88, his "Journal des Episodes, 366 Episodes pour orchestre symphonique" performed by the Winnipeg Symphony Orchestra in ‘92. As a visual artist, he was commissionned in ‘96 from the Canada Council to illustrate the cd box set, a compilation of Canadian music to celebrate the 50th anniversary of the United Nations. In ‘98, with a grant from the Conseil des Arts et des Lettres du Québec, he was resident of the Studio du Québec in New York City, then in 2007 at the Studio du Québec in Paris. 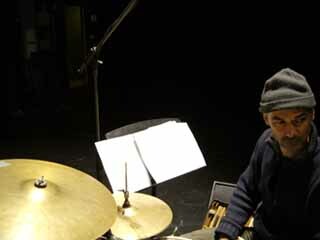 In 2004 he completed the 5 Double Duets, a series of drums and art duets with Daniel Humair, Han Bennink, Rakalam Bob Moses, Sven Ake Johansson and John Heward. Recently, with the support of Canadian Foreign Affairs, he brought his music “Out Twice”, two years in a row, across several European countries.